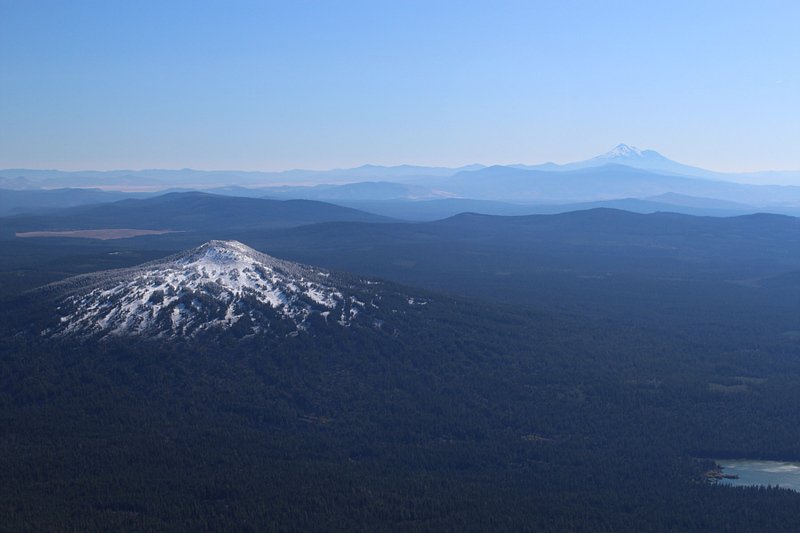 Mount McLoughlin is an exceptionally beautiful composite volcano located in the Sky Lakes Wilderness of southern Oregon. 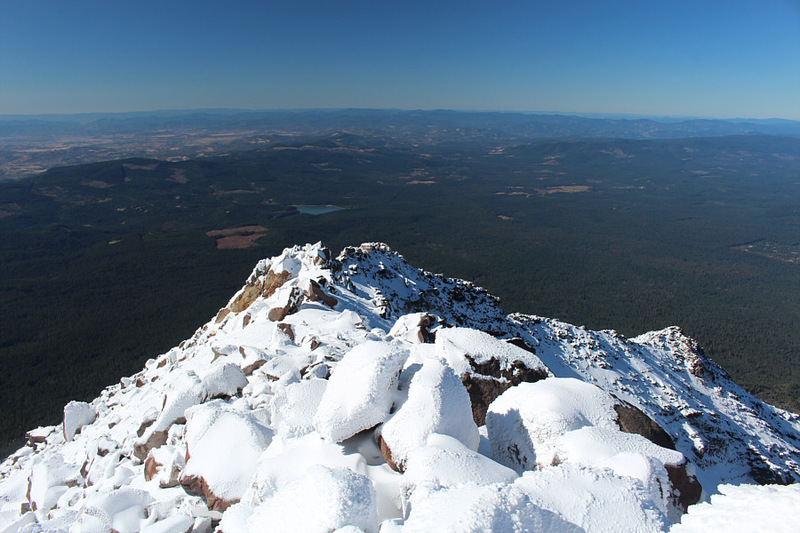 On 14 October 2017, Zosia Zgolak and I hiked up Mount McLoughlin via its technically easy east ridge. The trailhead is located along forestry road 3650 about 4 kilometres north of the turnoff from Highway 140. This turnoff is about 50 kilometres east of White City or 58 kilometres west of Klamath Falls. 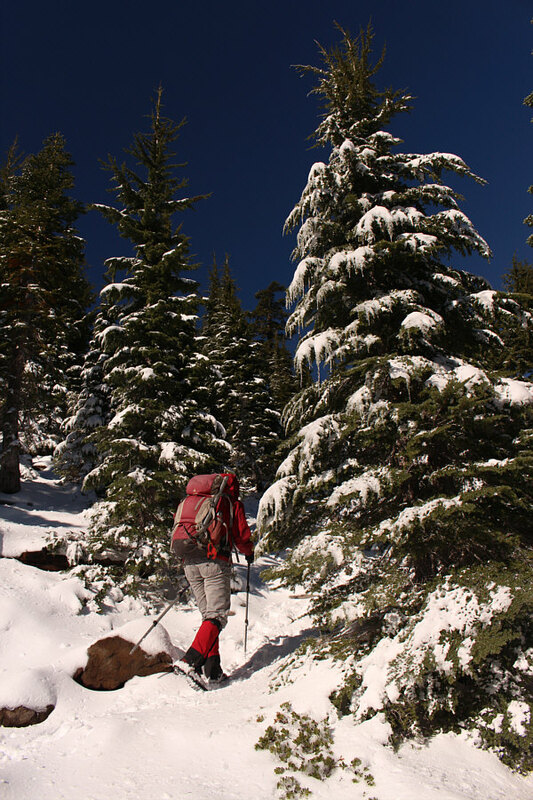 From the trailhead, we hiked a well-maintained trail which briefly joins the Pacific Crest Trail before branching off to climb steadily up forested slopes on the east side of Mount McLoughlin. 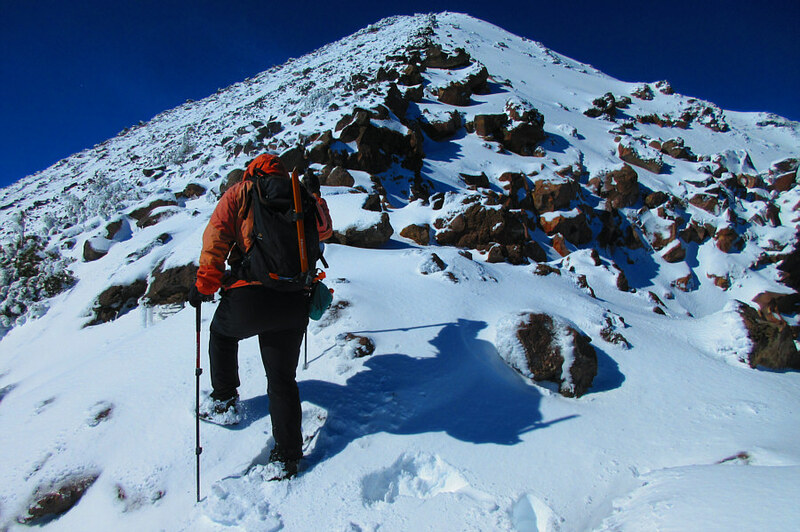 On this day, much of the trail was snow-covered, and as we climbed higher, it became increasingly difficult to stay on track. Several other hikers initially broke trail for us through the ankle-deep snow, but we eventually passed all of them and had to break our own trail. One particular pair of hikers were very fast and passed us early in the day, but they stopped quite often to sit down for a smoke. As the snow deepened higher up, I suspect that they lingered a bit longer on purpose to allow Zosia and me to break trail for them! On the upper mountain, we abandoned trying to stay on the trail and basically stuck to the crest of the east ridge as best as we could. 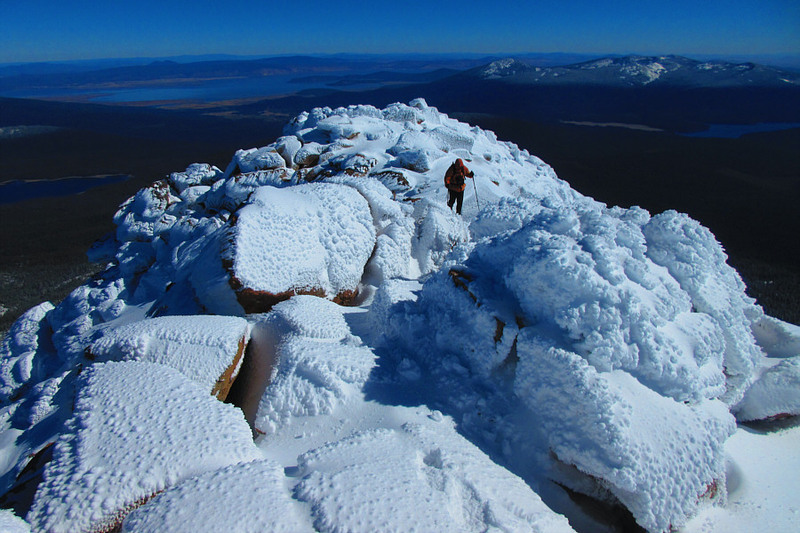 The combination of snow and big boulders made for some tricky footing, and we had to be extra cautious to avoid any nasty slips. A cold wind greeted us at the top, but we managed to find some shelter behind one of the bigger rocks on the summit to extend our stay. The smokers joined us on the summit a little later (they were the only other hikers besides us to make it to the summit on this day), but they did not stay for long. For our descent, we carefully retraced our steps down the east ridge, and sure enough, we again passed our smoking friends who appeared to be in no hurry to get down despite the lateness of the day. 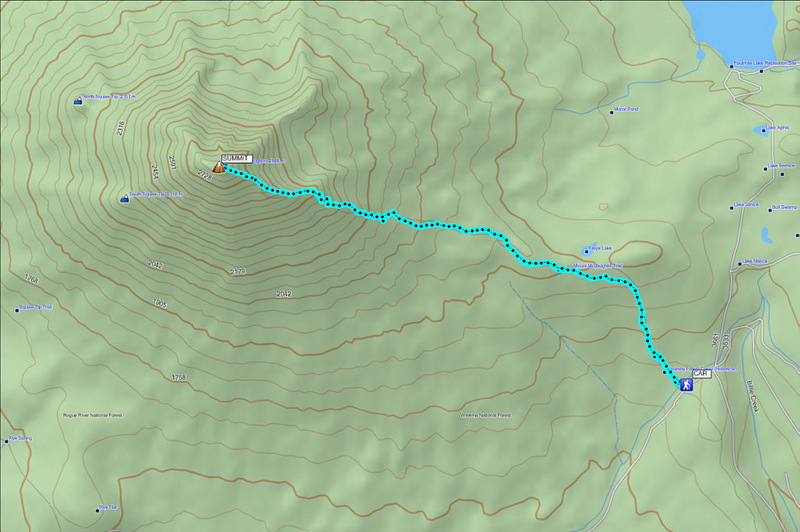 Once we regained the trail lower down, we enjoyed a long but uneventful hike back to the trailhead. 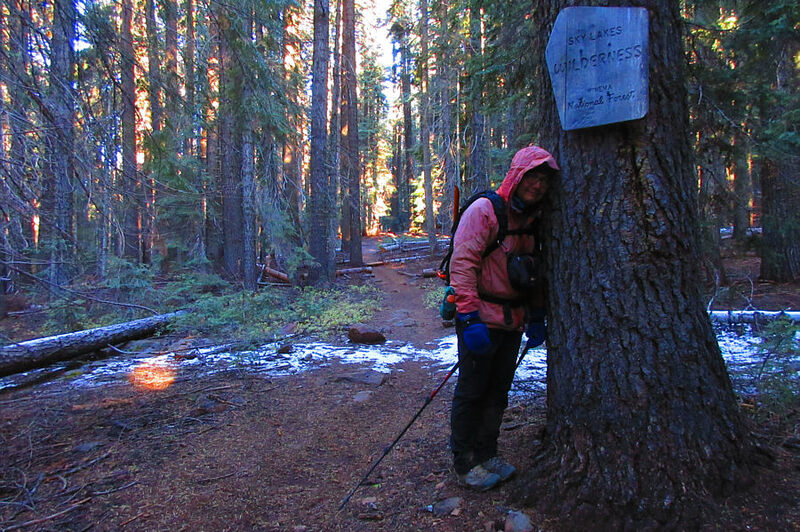 The trail to Mount McLoughlin is signed and well-maintained. 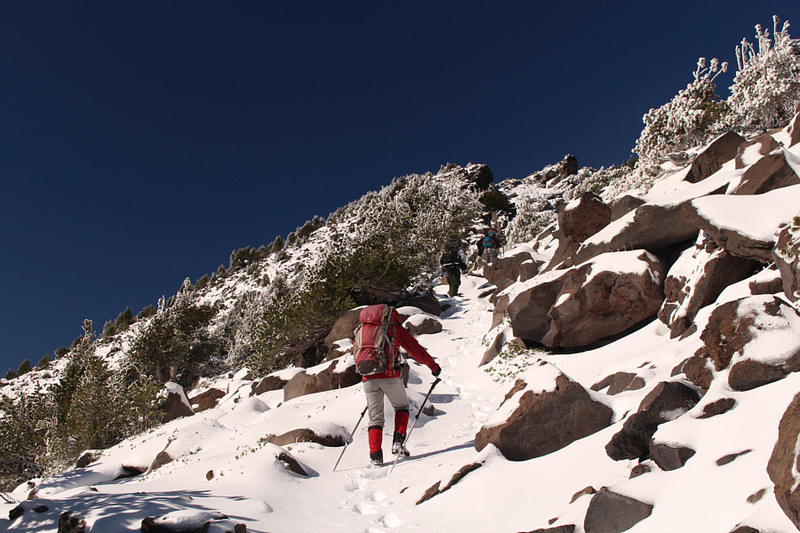 Higher up, snow cover makes the trail a bit harder to follow. A break in the trees offers a glimpse of northern California's Mount Shasta which is about 115 kilometres away to the south. 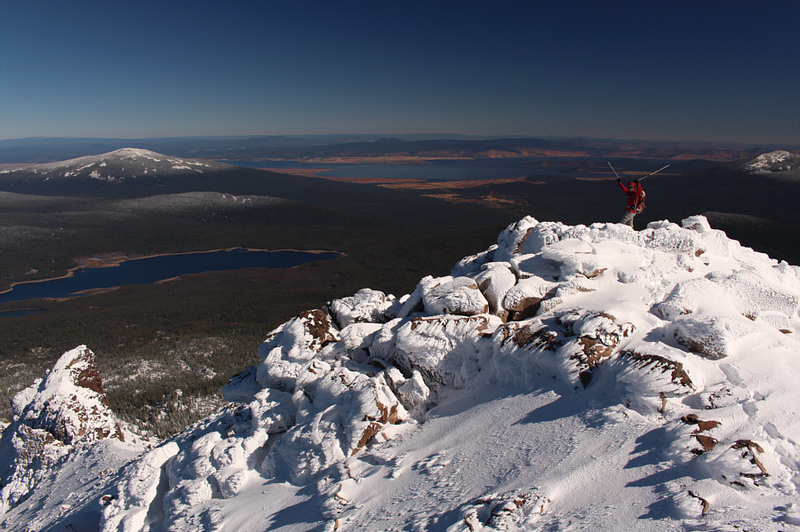 As the trees thin out, Fourmile Lake and Pelican Butte are revealed to the northeast. Zosia follows in the two smokers' tracks up the ridge. Zosia peers over the north edge of the east ridge. Zosia hikes up the east ridge. 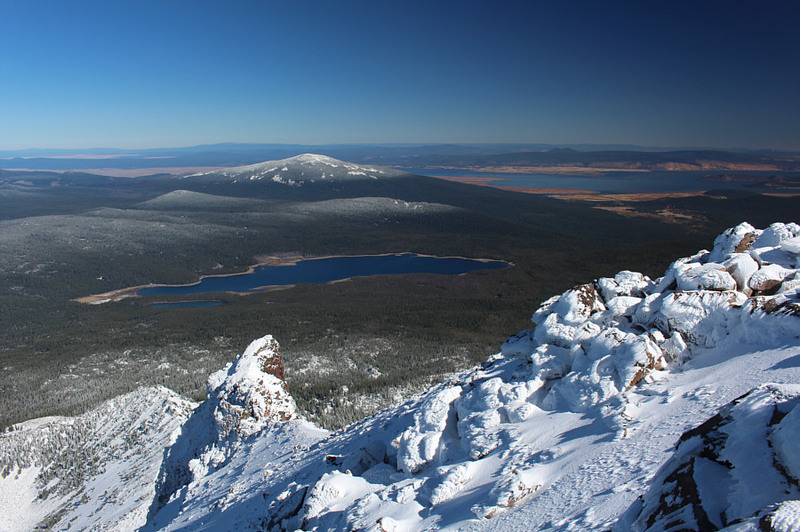 In the distance between Upper Klamath Lake (far left) and Lake of the Woods (right) are four overlapping shield volcanoes with the highest being Aspen Butte. Sonny passes the last of the trees on the upper mountain. 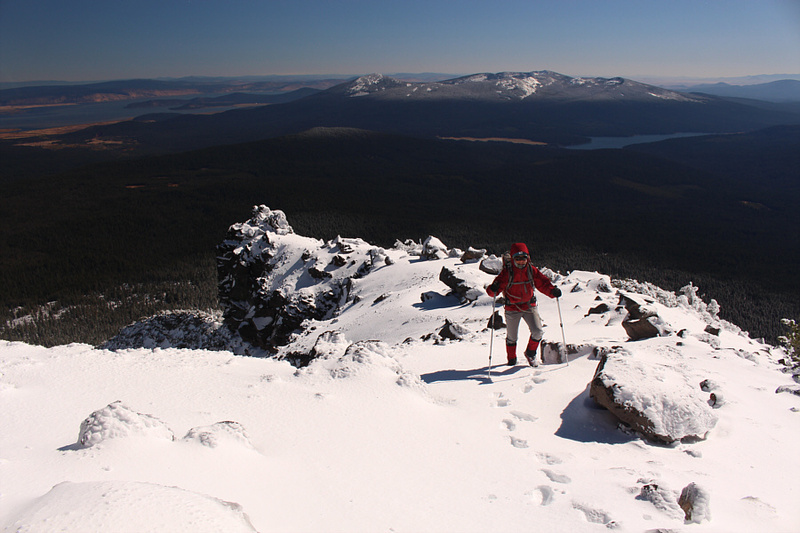 Zosia approaches the summit ridge. 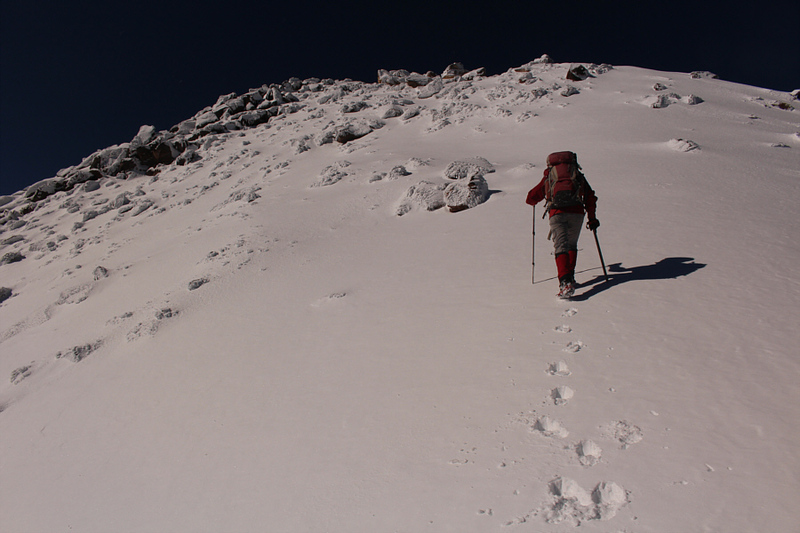 Sonny carefully makes his way along the summit ridge. 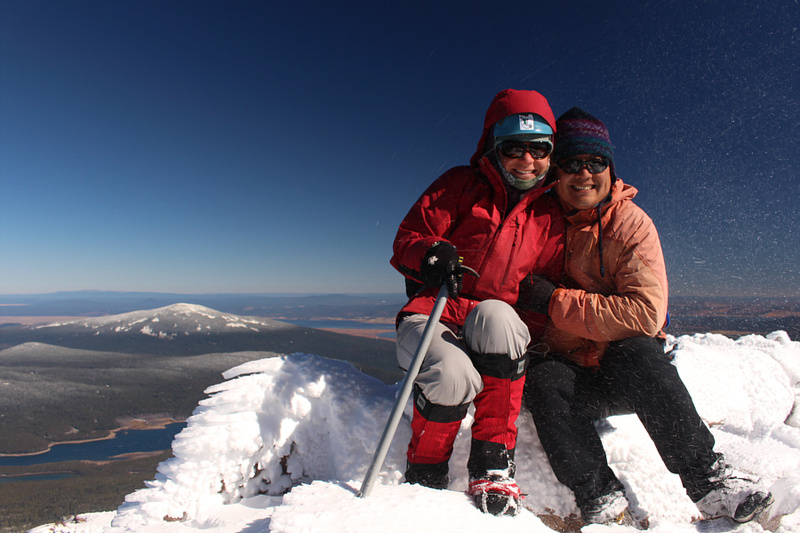 Zosia and Sonny huddle together on the summit of Mount McLoughlin (2894 metres). 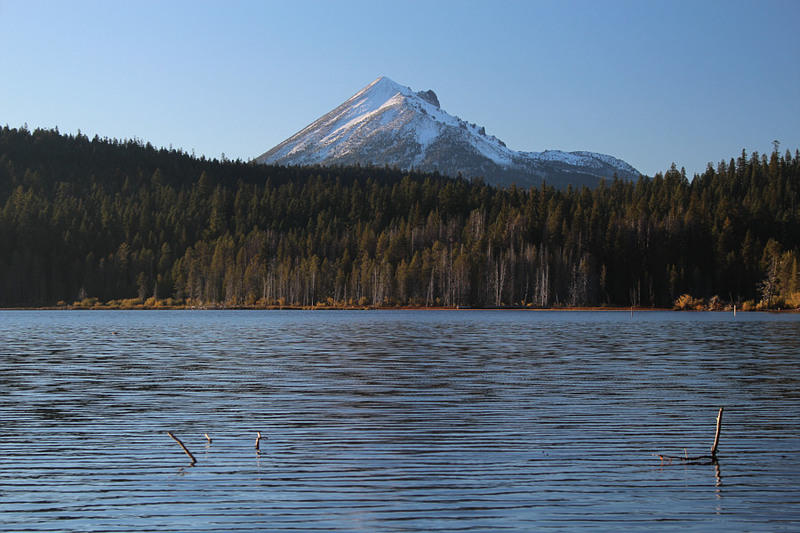 The most recognizable feature to the west is Willow Lake. 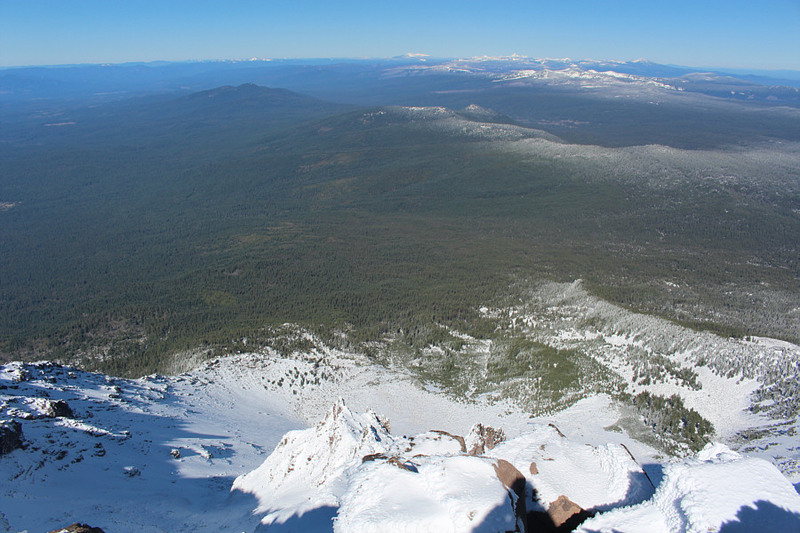 This is looking down the north face of Mount McLoughlin. 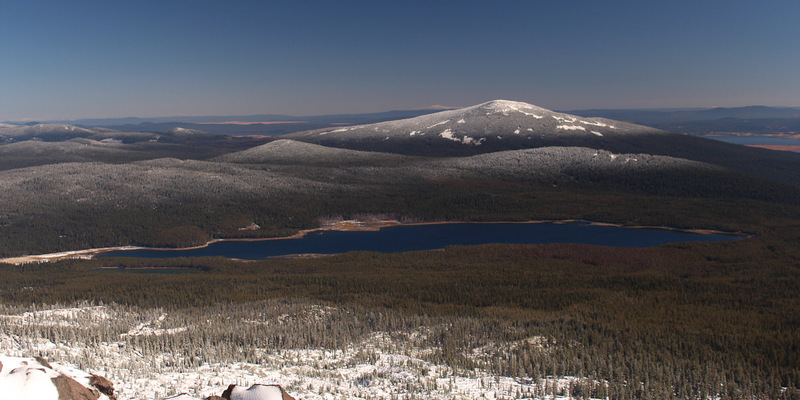 Here is the summit view of Fourmile Lake, Pelican Butte and Upper Klamath Lake. 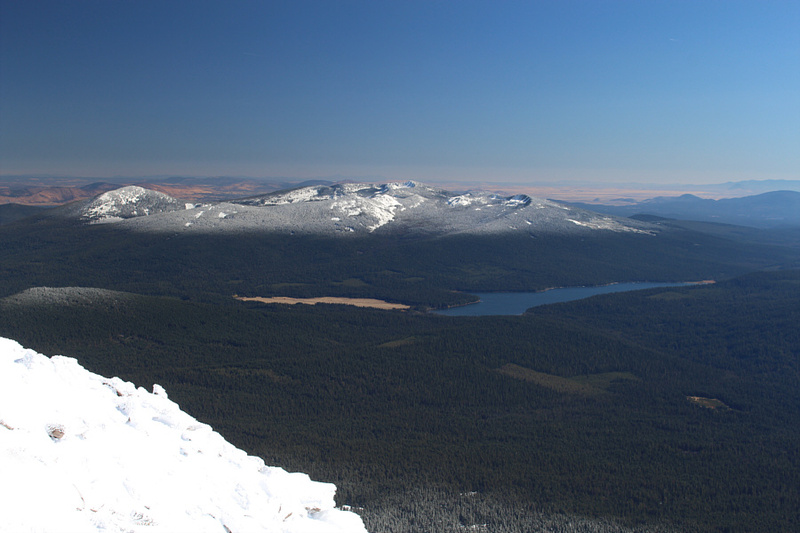 Of the four overlapping shield volcanoes visible to the southeast beyond Lake of the Woods, Mount Harriman (far left) is the most easily distinguished. 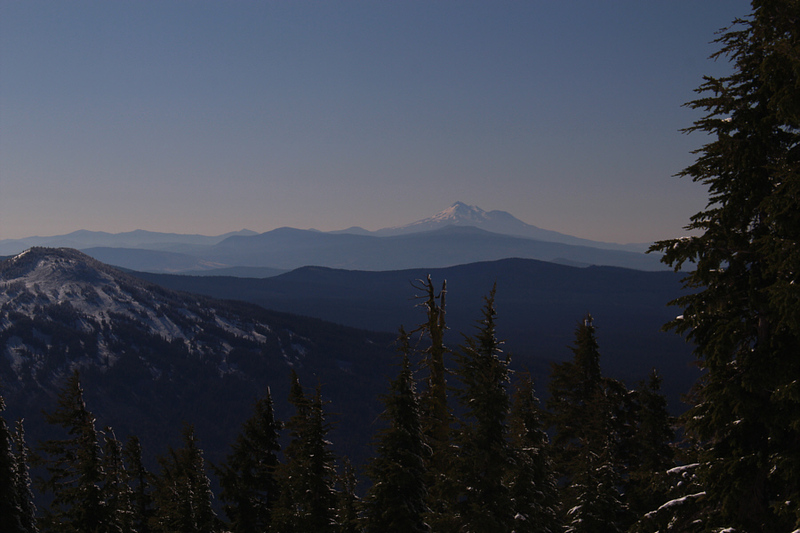 Brown Mountain and Mount Shasta (on the horizon) round out the view to the south. 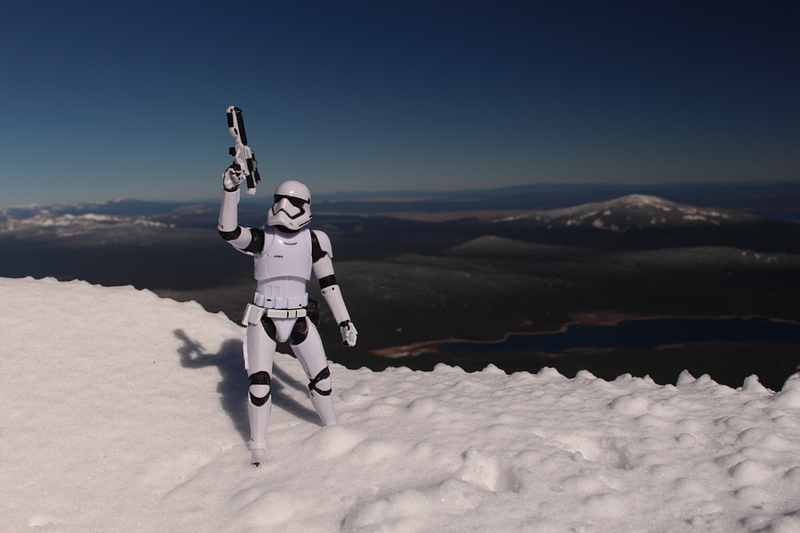 Zosia gives a cheer as she leaves the summit of Mount McLoughlin. 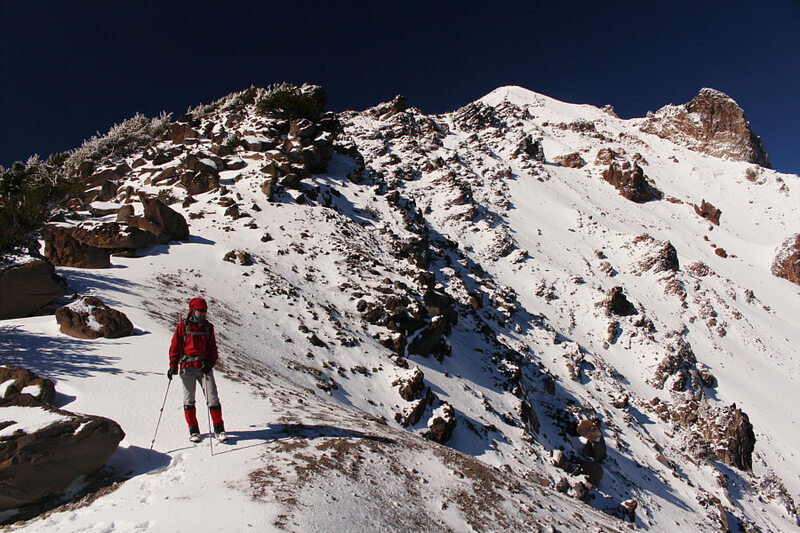 Most of the route up Mount McLoughlin's east ridge can be readily seen from Lake of the Woods.